The temperatures in the desert during my visit to see Bubby and Mac were, as I expected, ridiculously high. Spending time in the pool or at the water park was a great way to stay cool, but because we're not fish, other ways to chill out had to be devised. Yesterday, the last day of my visit, Megan offered a frozen treat to the boys that I thought was quite clever — and yummy, too. The night before, she dropped gummy bears into the bottom of plastic cups, filled the cups halfway with 7 Up, then added a popsicle stick and froze the cups. Bubby and Mac (and Megan and I, too) enjoyed licking the icy pops to free the candy bears from their frozen confines. So cool! I'm not sure what Megan's treats are officially called — I think she found the idea on Pinterest — but the way the boys enjoyed them reminded me of snow cones of summers past. Frozen fun on a hot summer day made all the difference in surviving the heat with a smile. It still does. With that in mind, I found the following feature — used with permission from Family Features — for a similarly syrupy sweet and frozen treat that grandparents still have time to make for the grandkids this summer. 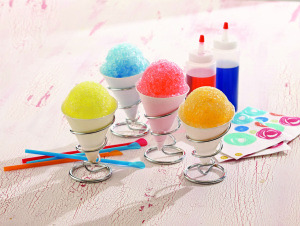 "Celebrate the flavors of summer with Easy Fruity Shaved Ice," said Mary Beth Harrington of the McCormick Kitchens. "The secret is in the flavorful syrups, which come together in just a few minutes with less than five ingredients, including fruit extracts and food colors." Bring sugar and water to boil in small saucepan on medium heat, stirring to dissolve sugar. Boil 1 minute. Remove from heat. For desired flavor syrup, stir in extract and food color. Cool to room temperature. Pour into squeeze bottle for easier serving. Pour syrup over shaved ice. Makes 2 cups syrup. For more cool summer ideas, visit www.McCormick.com, www.Facebook.com/McCormickSpice or www.Pinterest.com/mccormickspices. What is your favorite beat-the-heat treat?